The Scientia Education Experience (SEE) shapes the total learning experiences of UNSW students aligned with the educational aims of the UNSW2025. The SEE offers a combination of educational and experiential domains that capitalize on UNSW’s unique strengths in curriculum design, delivery and evaluation. The SEE is critical to program and course approval and review processes, as well as in teaching and assessment across all coursework programs. 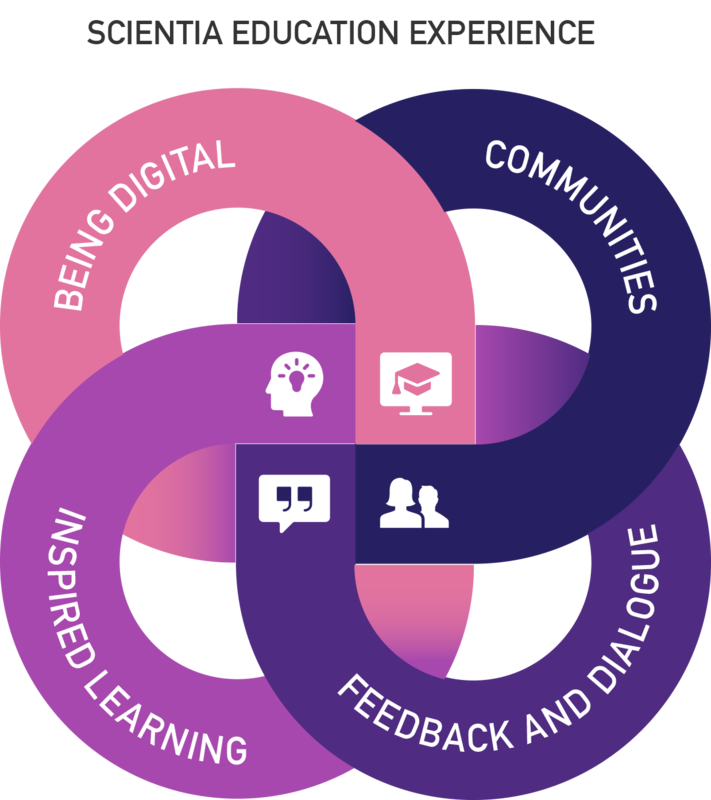 The SEE consists of four interconnected domains: Communities; Feedback and Dialogue; Inspired Learning through Inspiring Teaching; and Being Digital. The SEE also includes an outer ring that encapsulates the four domains. These are Inspiring Teaching and Students As Partners. Students and staff will be provided with opportunities to belong to, and be expected to contribute to, internal and external to UNSW communities consisting of scholars, learners, global, industry and alumni. Students and staff will engage in scholarly dialogue and give feedback on their experiences. Lecturers will receive feedback on their teaching and will have a responsibility to act on that feedback. Students will be inspired to learn through thoughtful design of courses and programs aligned to graduate capabilities as well as teaching that integrates the affordances of new physical and digital spaces, and current research. Students and staff will use digital technologies effectively to improve the flexibility, efficiency and timeliness of communication, administration and facilitation of relevant learning tasks. Traditional learning methods will be supported, supplemented or replaced by the most effective digital resources, content and tools and new opportunities for engaging students with the global community. The SEE includes an outer ring that encapsulates the four domains outlined in the above Table. Two phrases are used: “Inspiring Teaching” and “Students as Partners”. The SEE identifies the importance of recognizing, supporting and rewarding inspiring teachers, who inspire students and other teachers through their example. The SEE also recognizes the important role that students should play in ensuring UNSW offers the best learning experiences possible. The SEE is about investing, improving and expanding the learning and overall experience enjoyed by our students. It is not about randomly replacing evidence based effective teaching practices with digital alternatives. Rather, it is about harnessing the opportunities that technology can provide and recognising new possibilities for the convergence of the physical and digital learning environments. If is further about the benefits that active learning approach supported by appropriate curriculum design and delivery can offer. UNSW is committed to upgrading our learning spaces to facilitate and foster active learning. Students are making choices about when they will be on campus and so we need to be judicious in our learning designs so that we use the on-campus time with students appropriately and we use technology where it has been shown to offer an effective experience for students. The SEE is about fundamentally rethinking our learning designs so that we maximise the quality of the student experience and their outcomes. The domains of “Communities” and “Feedback and dialogue” can be seen in the personalisation of the learning experience of students, facilitated through the Students as Partners (https://teaching.unsw.edu.au/students-as-partners) initiative and the more widespread use of active learning spaces and data analytics. Staff and students will have access to more defined data sets that will inform their actions in teaching and learning. UNSW will provide more opportunities for students to participate in activities outside formal program requirements, including study abroad, work integrated learning and research integrated learning activities. To further enhance the domain of “Communities” all programs will incorporate activities that facilitate student participation in group activities that are relevant to the program. Opportunities for physical and online social networking activities will be systematically developed over the coming years. Feedback will be enhanced in two main areas. We will actively listen and respond to what students are telling us about their experience. We can celebrate the activities that are having a positive impact on the student experience and we will work to change activities and approaches when students are making it clear that their experience is not a positive one. Active monitoring and reporting of the actions arising from student feedback will be a feature of the SEE. All coursework programs will demonstrate a more active use of student feedback and learning analytics to promote a dialogue between staff and students on how programs may be further enhanced. Feedback will also be in the form of more effective, and where practicable, personalised feedback to students on their work. Students should not expect to wait until the end of a teaching period to receive feedback on how they are performing. We can use technology more effectively to provide more frequent feedback to students on their performance and to cope with feedback on a large scale. This is where “Being Digital” and “Feedback and Dialogue” converge. The domain of “Inspired learning through inspiring teaching” promotes the expectation that our approaches to course design and delivery should inspire our students to succeed in their life goals. We should be able to reward and recognize, through awards and promotion processes, our outstanding teachers who enact this domain to a high standard. As part of course and program design, staff will need to design learning activities that are likely to inspire students to engage more deeply with their discipline and relate these program activities to research and professional practice opportunities. “Being Digital” is not about digitising an analogue experience; it is about a fundamental shift in our concept of how we undertake our core work in learning and teaching. If we are to fully achieve the “Being digital” domain of the SEE, we need to start thinking of the online experiences of our students and staff as if the digital cloud environment were a campus, just like our physical campuses. We need to plan and implement resources and processes that use new technologies to enhance community building, active communication that encourages timely feedback and inspire us to achieve outcomes that further enhance the reputation of UNSW. The SEE describes an approach and a guide to help us improve the total learning experiences of our students at UNSW. The SEE complements rather than replaces the existing UNSW Integrated Curriculum Framework, Graduate Capabilities and Program and Course Learning Outcomes. The SEE describes common approaches and features that will appear in all programs so that students will have an outstanding experience no matter which program they complete at UNSW. The adoption of a simple, concise articulation of the SEE for the UNSW educational experience will promote the values of UNSW and ensure that all our programs offer an inspiring and positive outcome for our students. The four domains represent a consistent reference point for benchmarking our existing processes for curriculum design and delivery, program and course approval and review processes, and our approaches to teaching and assessment in our coursework programs.